Prior to this study, relatively few strains of Francisella had been genome-sequenced. Previously published Francisella genome sequences were largely restricted to the zoonotic agent F. tularensis. Only limited data were available for other members of the Francisella genus, including F. philomiragia, an opportunistic pathogen of humans, F. noatunensis, a serious pathogen of farmed fish, and other less well described endosymbiotic species. We determined the phylogenetic relationships of all known Francisella species, including some for which the phylogenetic positions were previously uncertain. The genus Francisella could be divided into two main genetic clades: one included F. tularensis, F. novicida, F. hispaniensis and Wolbachia persica, and another included F. philomiragia and F. noatunensis. Some Francisella species were found to have significant recombination frequencies. However, the fish pathogen F. noatunensis subsp. noatunensis was an exception due to it exhibiting a highly clonal population structure similar to the human pathogen F. tularensis. The genus Francisella can be divided into two main genetic clades occupying both terrestrial and marine habitats. However, our analyses suggest that the ancestral Francisella species originated in a marine habitat. The observed genome to genome variation in gene content and IS elements of different species supports the view that similar evolutionary paths of host adaptation developed independently in F. tularensis (infecting mammals) and F. noatunensis subsp. noatunensis (infecting fish). Tularemia is a zoonotic disease caused by the highly infectious, virulent, Gram-negative bacterium Francisella tularensis. Due to its infectious nature, ease of dissemination and associated high fatality rate (especially from respiratory infection), F. tularensis has been included in military biological weapons programs and is regarded as one of the top six agents which have a high potential for misuse in bioterrorism. The known diversity of the genus Francisella has recently expanded substantially and the boundaries between taxonomic units within the genus is currently under debate[2, 3]. In mammals, including man, the disease tularemia is caused by two F. tularensis subspecies: subsp. tularensis (type A, endemic in North America) and subsp. holarctica (type B, found throughout the Northern hemisphere). Nearly all fatalities due to tularemia are caused by F. tularensis type A infections, for which mortality rates up to 30% have been reported. In contrast, F. tularensis type B causes a milder disease, for which fatalities rarely occur. A third accepted subspecies, F. tularensis subsp. mediasiatica is found in central Asia. This subspecies has been found to display level of virulence comparable to strains of subspecies holarctica and very rarely cause human infections[6, 7]. Disease in humans has also been presented following opportunistic infection by F. novicida (in individuals with a weakened immune system) and F. philomiragia (in individuals with a weakened immune system exposed to sea water)[8–10]. A number of Francisella lineages also exist that do not appear to be associated with human disease. 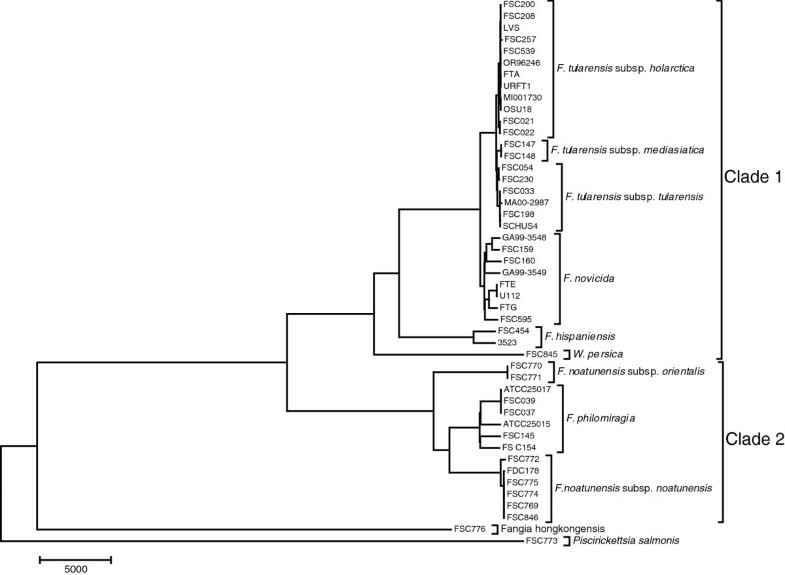 Strains closely related to F. philomiragia, which have recently been designated as Francisella noatunensis, have been identified as etiological agents of Francisellosis in fish[11–15]. F. noatunensis is further divided into two subspecies, subsp. noatunensis and subsp. orientalis[17, 18]. Recent published studies have also identified several new related and as yet uncultured forms of Francisella from soil and water[19–23], as well as tick endosymbionts with high similarity to F. tularensis (Francisella-like endosymbionts). One isolated tick endosymbiont has inaccurately been designated Wolbachia persica, incorrectly placing it within the alpha- proteobacteria. Further, a marine ciliate endosymbiont has been proposed to represent ‘Candidatus F. noatunensis subsp. endociliophora’ and a bacterium isolated from an air-conditioning system has been tentatively classified as Francisella cantonensis. Thus, in recent years the existence of substantial sub-species diversity within the Francisella genus has become increasingly apparent. Members of Francisella appear to be associated with a multitude of different ecological niches, ranging from specialised endosymbionts and pathogens with different host spectrums, to generalists believed capable of a free-living existence. There are several reasons for sequencing Francisella strains other than those belonging to F. tularensis. Analysis of gene content and genetic relationships may help to improve our understanding of the biology and evolution of these bacteria, including that of the human pathogen F. tularensis. Sequencing multiple strains of environmental Francisella may also reveal important sequence differences between environmental species and F. tularensis. This would allow the design of increasingly specific F. tularensis detection assays for use in anti-bioterrorism applications and epidemiological studies, particularly important since current methods frequently falsely detect F. tularensis in environmental samples. The genome sequence data generated by the present study represents a considerable advancement of knowledge of the genus Francisella and includes genome sequences for 18 environmental Francisella strains, four F. tularensis and two distant but genetically related species Fangia hongkongensis and Piscirickettsia salmonis. Here we describe the population structure of the genus Francisella, suggest that ancestral Francisella strains originated in marine habitats, show that present-day strains can be divided into two main genetic clades occupying continental and aquatic habitats and provide evidence that similar evolutionary paths of host adaptations have occurred independently in F. tularensis (infecting mammals) and F. noatunensis subsp. noatunensis (infecting fish). Here, we present 24 novel genome sequences representing all major subclades of the Francisella genus (Table 1), with the exception of the recently discovered F. cantonensis. The data doubles the number of published Francisella genomes and significantly extends the known range of genetic diversity. The studied material includes seven previously unsequenced F. noatunensis isolates and a single representative from the tick endosymbiont group. In addition, representatives of Fa. hongkongensis and P. salmonis, both of which are related to the genus Francisella, were also sequenced. Interestingly, Francisella strain 3523[33, 34] appeared to belong to the F. hispaniensis clade and not the F. novicida clade as reported previously. 1 FDC178 was supplied by the Marine Institute, Oranmore, Ireland. 2 FSC774 was supplied by the National Veterinary Institue (NVI), Norway and FSC775 was requisitioned from the German Microorganism Collection (DSM). 3 FSC 160 (fx1) was supplied by VAMC, Houston, Texas. (Previously published FSC156 (fx1) was supplied by another lab.). 4 FSC539 from same patient as FSC529 in Svensson et al 2009. Information about isolates sequenced in this study. Overall, a major bifurcation into two genetic lineages was identified (Figure 1) with clade 1 comprising F. tularensis, F. novicida, F. hispaniensis and W. persica, and clade 2 containing F. noatunensis and F. philomiragia. Whole-genome phylogeny. The phylogeny of 45 Francisella strains and two genetic relatives, Fangia hongkongensis and Piscirickettsia salmonis, based on single nucleotide polymorphism in the core genome. The Francisella genus is divided into two parts, clade 1 (F. tularensis and F. novicida) and clade 2 (F. noatunensis and F. philomiragia). Whole-genome alignments were produced using progressiveMauve. A phylogeny based on core genome single nucleotide polymorphisms is shown in Figure 1. Analysis of the whole-genome phylogeny showed that strains of F. philomiragia and F. noatunensis subsp. noatunensis formed sister clades, while strains of F. noatunensis subsp. orientalis diverged at a more basal position, indicating the newly named species F. noatunensis is paraphyletic. This interpretation was supported by an analysis of average nucleotide identities (ANI): ANI for F. philomiragia compared to F. noatunensis subsp. noatunensis is higher (95%) than F. philomiragia compared to F. noatunensis subsp. orientalis (92–93%) Additional file1. Phylogenetic inference using whole-genome data and 16 S ribosomal RNA genes resulted in incongruent topologies. The phylogenetic position of F. philomiragia (Figure 1) was different from previous publications of phylogenies calculated based on 16 S ribosomal RNA genes (Additional file2)[13, 14]. Based on the analysed gene orthologs, the core genome of the genus Francisella contained 803 genes (Figure 2A). Clade 1 shared 854 genes, while clade 2 (F. noatunensis and F. philomiragia) shared 1359 genes (Figure 2B). Overview of core and pan genome structure for the Francisella genus. A. Accumulation curve (core genome) for the number of genes in common as a function of the number of genomes analysed for the Francisella genus. B. Accumulation curve for the total number of genes (pan genome) as a function of the number of genomes analysed for clade 1 (F. tularensis, W. persica and F. hispaniensis)(red) and clade 2 (F. philomiragia and F. noatunensis)(yellow). C. Cumulative accumulation of total number genes when genomes are added according to the structure in the SNP phylogeny. Ftt – F. tularensis subsp. tularensis, Fth – F. tularensis subsp. holarctica, Ftm – F. tularensis subsp. mediasiatica, Fn – F. novicida, Fh – F. hispaniensis, W – Wolbachia persica, Fno – F. noatunensis subsp. orientalis, Fnn – F. noatunensis subsp. noatunensis, Fp – F. Philomiragia. The pan-genome of the genus Francisell a contained a total of 5396 genes (Figure 2C). Separate analysis of the pan-genome size within clade 1, excluding F. hispaniensis and W. persica, and clade 2 identified 3222 and 3535 genes, respectively (Figure 2B). The pan-genome of F. tularensis contained 2769 genes. An overview of the gene distribution in the genus Francisella is depicted in Figure 3 and the clade-specific genes are summarised in Table 2. The human pathogen, F. tularensis contained only seven unique genes (FTT0794, FTT0795, FTT0796, FTT1188, FTT1453c, FTT1454c and FTT1458), which grouped at three different locations in the genome. No unique genes were found in F. novicida genomes. F. hispaniensis, F. noatunensis and F. philomiragia exhibited seven, nine and ten unique genes, respectively. The complete clade 2 (F. noatunensis and F. philomiragia) genomes displayed 41 genes that were not present in clade 1. However, the clade 2 species F. noatunensis subsp. noatunensis and F. noatunensis subsp. orientalis shared 32 and 114 genes, respectively, which were not present in other genomes. Whole-genome comparison of the pan-genome of 45 Francisella strains. Presence of a gene in a genome is indicated in black. The core genome of 803 genes, and the genes unique to clade 1 (F. tularensis, F. novicida, F. hispaniensis and W. persica) and clade 2 (F. noatunensis and F. philomiragia) are clustered together in the heat map. F. philomiragia, F tularensis subsp. tularensis, F. tularensis subsp. holarctica, F. tularensis subsp. mediasiatica, F. novicida, F. hispaniensis, W. persica, F. hongkongensis, P.
Summary of clade-specific genes in the Francisella genus. Notable differences in IS element content were identified between different species and clades. In clade 1, F. hispaniensis contained a few copies of ISFtu2, ISFtu3, ISFtu4, ISFpi1 and IS4502, while W. persica contained very few copies of ISFtu2 and ISFtu3. The isolates in clade 2 exhibited a different pattern of IS elements. Whereas F. noatunensis subsp. orientalis was almost completely lacking IS elements (only a potential trace of ISFpi1 was found), F. noatunensis subsp. noatunensis exhibited an expansion trend similar to that previously reported for F. tularensis. The expansion was within the ISFpi1 group and included a handful of copies of the IS4502 element, and single copies of ISFtu1, ISFtu2 and ISFtu3 elements. The more distant relatives studied, i.e. Fa. hongkongensis and P. salmonis, contained completely different sets of IS elements compared with Francisella. The genome of P. salmonis was enriched with ISPsa1 and ISPsa2, whereas only one copy of ISFpi1 was found in Fa. hongkongensis. The IS element distributions of F. tularensis, F. novicida and F. philomiragia have been reported previously[36, 38]. Results of the recombination analyses are presented in Figure 4 and Additional file3. The proportion of genes within the Francisella core genome demonstrating evidence of recombination was 32%, although the presence of recombination was highly variable across the different Francisella lineages. For some species/subspecies, recombination was entirely absent (i.e. F. tularensis subsp. tularensis, F. tularensis subsp. holarctica and F. noatunensis subsp. 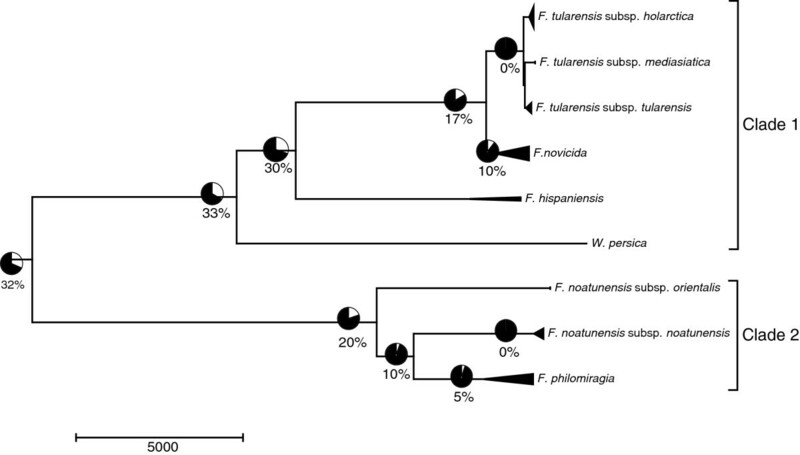 noatunensis), whereas recombination in F. philomiragia and F. novicida occurred frequently. Overview of the recombination. The proportion of genes showing evidence of recombination overlaid on the Francisella phylogeny. Recombination detection was performed using the PHI method with the number of significant tests (P < 0.01) reported as a percentage of recombinant genes within the Francisella genus. To date, sequenced Francisella genomes have mainly been of the human pathogenic species F. tularensis. Consequently, conclusions about evolutionary processes within the genus Francisella have largely been based on F. tularensis genomes[36, 38]. Moreover, a number of identification assays developed on the basis of F. tularensis genome sequences have been shown to give false-positive results. These have been attributed to the presence of the same sequence signatures as in other environmental Francisella lineages. In the present study, we provide details of the genetic content of nearly all currently known members of the genus Francisella, with the exception of the recently published F. cantonensis. Despite a generally high sequence similarity within the genus, we found that different genetic clades demonstrated different population structures (recombination frequencies). This suggests differences in lifestyle and host association. F. tularensis has been found to be a highly clonal species, differentiating it from environmental lineages characterised by moderate recombination rates. We also found evidence that the fish pathogen F. noatunensis subsp. noatunensis also possesses a highly clonal lineage. The low recombination frequency in F. noatunensis subsp. noatunensis may indicate that a close host association reduced contact with other Francisella species, and thereby, lowered opportunities for gene acquisition by recombination, as previously hypothesised for F. tularensis. The data of population structure and variability observed among F. novicida opposed to F. tularensis subspecies tularensis, holarctica and mediasiatica strains should be taken in consideration for the on-going discussion whether it should be a separate species or included as a subspecies in F. tularensis. Our analyses of 45 Francisella genomes showed that recognised species could be divided into two main genetic clades (Figure 1) and suggested that the pathogenic species in each clade emerged independently by similar evolutionary paths of host adaptation. F. tularensis, which can infect mammals, belonged to clade 1, whereas F. noatunensis subsp. noatunensis, which infects fish, belonged to clade 2. Our analyses based on the phylogeny of Francisella genomes and genetic relatives suggest that the ancestral Francisella species originated in a marine habitat. Using whole-genome analysis, we found evidence that F. noatunensis subsp. noatunensis and F. noatunensis subsp. orientalis represent a paraphyletic group. F. philomiragia and F. noatunensis subsp. noatunensis together form a sister clade to F. noatunensis subsp. orientalis (Figure 1, Table 1). This result was not supported by 16 S RNA analysis, which suggested that the two subspecies F. noatunensis subsp. orientalis and F. noatunensis subsp. noatunensis form a clade. There are limited nucleotide differences in the 16 S region and more comprehensive core genome SNP analysis gives a better view of the real relationship. Identification of genetic factors coding for fish pathogenicity may therefore be possible via comparative analyses. Further phenotypic studies and experiments are needed to confirm this hypothesis. Since F. noatunensis subsp. noatunensis is isolated from cod and salmon, while F. noatunensis subsp. orientalis isolates are recovered from tilapia and three-line grunt, an alternative hypothesis is that these subspecies evolved their abilities for fish infection independently. In agreement with other studies[26, 40], our analyses verified the phylogenetic position of the tick endosymbiont W. persica within the Francisella genus. Several lines of genomic evidence support the view that this organism adapted as a primary symbiont; its genome size was found to be significantly less (about 80–85%) than other Francisella genomes. Moreover, in W. persica, regulatory genes were found to be depleted, while biosynthesis pathways supplying amino acids to their insect host were retained, and there was a low abundance of IS elements. Our results confirm that W. persica and other Francisella-like endosymbionts (FLE)[19, 24, 41, 42] belong to the genus Francisella and that W. persica has undergone a significant reduction in its genome. An important outcome of the present study was reclassification of the isolate 3523 from Australia. It was initially classified as an unusual F. novicida, a classification which remained despite whole genome sequencing. It was clear from the present analyses that isolate 3523 belongs to the F. hispaniensis clade. This result demonstrates the importance of broad-scale intra-genus sequencing for correct classification of new isolates. The overall core genome size of 799 genes for the genus Francisella was similar to that reported for the genus Bacillus (Figure 2A). Bacterial pan-genomes at the genus level have only recently been reported in the literature, and the number of gene families in these genera is expected to grow as more genomes are included. This approach may be valuable in revealing genes specific for niche commonalities between subspecies. We detected different pan-genome sizes for clade 1 and clade 2 (Figure 2B), where clade 2 contain more genes compared to clade 1 and especially F. tularensis clade alone. As a result, F. tularensis may be fully sampled by sequencing smaller set of representative isolates, whereas more isolates of clade 2 would need to be fully sequenced to give a true pan-genome size. The contribution of each genome to the complete pan-genome of the genus Francisella and related organisms is illustrated in Figure 2C. Most genomes contribute to the increase of the pan-genome, although the increase is less pronounced when similar genomes are added. Genomes in the Francisella genus have, with the exception of W. persica, similar gene composition. W. persica has not retained genes included in the COG group ‘amino acid transport and metabolism’, which it does not require because of its endosymbiotic lifestyle. An extensive list of 80 potential candidate virulence genes has previously been published, which are specific for the human pathogen F. tularensis. Surprisingly, analysis of the more complete collection of Francisella genomes in the present study reduced this list to only seven F. tularensis specific genes. The general lack of specific genes agrees with previous observations that pathogens exhibit specialisation and host-adaption by gene loss rather than gene gain. Thus, a pathogen such as F. tularensis should be defined not only by genes that are present but also by those that are lacking. The seven specific genes in F. tularensis were located in three separate gene clusters. The genes in the first cluster (FTT0794, FTT0795, FTT0796) are organised in an operon and were predicted to be involved in exopolysaccharide synthesis. It has been suggested that an exopolysaccharide capsule plays a role in F. tularensis virulence. The second gene cluster (FTT1453c, FTT1454c and FTT1458) is present within the wbt locus of F. tularensis. Genes in this locus encode proteins involved in lipopolysaccharide O-antigen synthesis. The O-antigens of F. tularensis contain an insertion element that differentiates it from F. novicida. A similar insertion element structure has been reported to be essential for virulence in Shigella sonnei. Finally, the last gene cluster contained a single gene, FTT1188, which encodes for a hypothetical membrane protein. This protein does not exhibit significant homology to other proteins in the NCBI non-redundant database and has not yet been characterised in depth. Identification of virulence genes and their role in the virulence of Francisella is not straight-forward. Our data suggest that F. tularensis virulence cannot be easily explained by a simplistic model which just considers the presence or absence of specific “virulence genes”. Fa. hongkongensis and P. salmonis both contain many genes that are absent from the Francisella genus and are therefore likely to occupy distinctly different ecological niches. The two principal clades of the Francisella genus exhibit several similarities and differences in IS element content and composition. F. noatunensis subsp. noatunensis contains an expanded set of IS elements similar to those reported for F. tularensis. The expanded IS elements in F. tularensis are ISFtu1 and ISFtu2, whereas the expanded IS element in F. noatunensis is ISFpil. Interestingly, the two subspecies of F. noatunensis exhibited contrasting contents of IS elements. While F. noatunensis subsp. noatunensis contained the highest number of IS elements of all species in the genus, F. noatunensis subsp. orientalis contains very few IS elements. This may have arisen because of different evolutionary modes in these subspecies. Recombination is an important process for generating new genetic diversity within bacterial populations and is a known driver of evolution in many bacterial species. The recombination analysis of 45 genomes in the present study confirmed that the level of recombination within the Francisella genus is highly variable, ranging from undetectable in F. tularensis to moderate in F. novicida. We found that the subspecies of F. noatunensis exhibited apparently low rates of recombination at levels similar to the human pathogen group of F. tularensis. 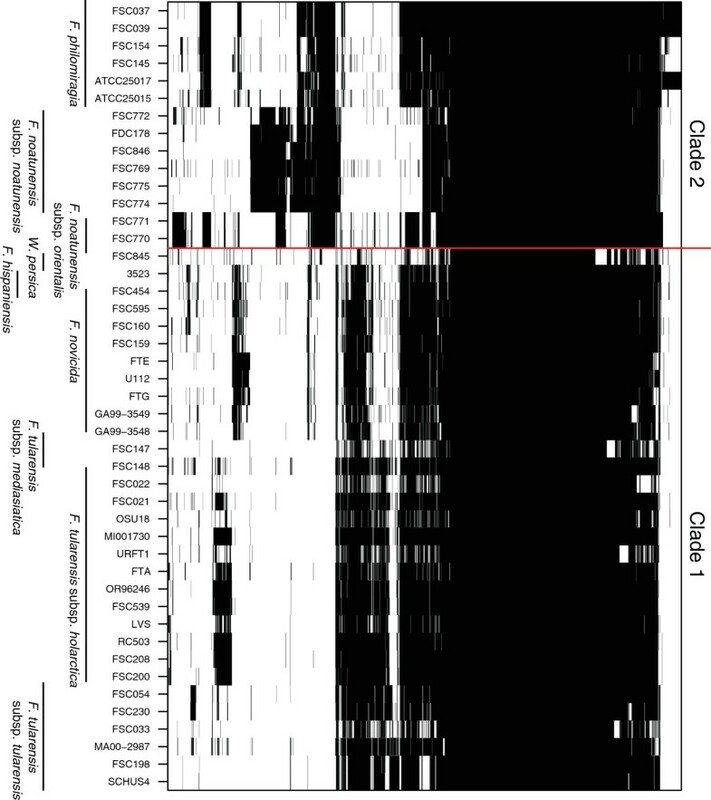 Otherwise, both clade 1 and II displayed moderate recombination rates, largely due to frequent recombination within F. novicida (clade 1) and F. philomiragia (clade 2). According to our findings, 33% of the core gene set provided evidence of past recombination events, similar in magnitude to estimates for Campylobacter and Neisseria, but higher than previously reported for Francisella. It was reported previously that 19.2% of the genes in the core genome of F. novicida and F. philomiragia have been recombined, but our data suggests that this is could be an underestimate due to a lack of genomic sequences available at that time. Our findings are similar to reports for other bacterial genera that include highly specialized pathogens. Variable recombination rates have previously been reported for several pathogenic populations, (Yersina pestis, Bacillus anthracis and Mycobacterium tuberculosis). It should be noted that if closely related clones of pathogens with low recombination rates are over-represented, this can result in an under-estimation of recombination rates for the entire genus[50, 56]. By ensuring proper representation of all subspecies of the Francisella genus in the present work, such effects were minimised. This work significantly expands the number of sequenced Francisella genomes, and therefore provides an important resource for assessing evolutionary and functional relationships within the genus. We identified the core genome in the Francisella genus and single nucleotide polymorphisms within these genes were used to infer a robust phylogeny. A high degree of clonality confirmed for F. tularensis type A and B, was also identified in F. noatunensis subsp. noatunensis. Despite infecting different species, it is apparent that these lineages also share certain important evolutionary properties. Next-generation sequencing enables rapid generation of high quality data for the fast assembly of novel genomes. Growing databases of genome sequences are of significant interest for improving the designs of specific detection assays, conducting epidemiological and ecological studies, microbial forensics and classification of novel bacterial isolates. Comparative genomic approaches together with functional datasets will be critical for the development of assays that specifically target pathogenic Francisella strains. All strains (Table 1), except FSC845, were cultured on cysteine heart agar plates supplemented with 5–9% chocolatised sheep blood (CHAB) (BD Biosciences, Franklin Lakes, NJ USA), or Modified Thayer-Martin (McLeod) agar plates, at 25°C for the eight strains FSC769 to FSC776, and at 37°C for all other strains, in 5% CO2 for 5 days (F. tularensis strains) or up to ~30 days (non-F. tularensis strains). A loopful of bacteria was suspended in 1 x TRIS-EDTA (TE) buffer to 109 CFU/ml and heat-killed at 95°C for 15 minutes. The bacteria were lysed using Buffer ATL (Qiagen, Hilden, Germany), or similar non-denaturing lysis buffer. DNA was prepared using phenol extraction (PE), or extraction with Biorobot EZ1 (Qiagen, Hilden, Germany) according to the manufacturer’s protocol. Sterility was verified by lack of growth on Modified Thayer-Martin (McLeod) plates after incubation of 10 μl DNA (if PE was used) or lysate (if EZ1 was used) for 10 days. The strain FSC845 (Wolbachia persica) was propagated in cells, and bacteria were collected by differential centrifugation. Bacterial cell pellets were suspended in phosphate-buffered saline (PBS) and DNA was prepared as above. For FSC772 and FDC178, DNA was prepared using the Gentra Puregene Cell kit (Qiagen, Hilden, Germany) and was re-suspended in a hydration solution supplied with the kit. DNA concentrations were measured using Nanodrop (Thermo Scientific, Wilmington, DE, USA). DNA for genomic sequencing of 24 isolates from the Francisella genus and genetic relatives were prepared as described in Table 1. 19 genomes were sequenced at the National Bioforensic Analysis Center using a 454 FLX machine (454 Life Sequencing Inc., Branford, CT, USA) according to the manufacturer’s instructions. Additional sequencing was performed using the Illumina GS II sequencing 36 bp or 76 bp SE technology. Additional file4 provides summary data of the sequenced genomes. Isolates sequenced with both technologies were first assembled using Newbler. Obtained contigs were corrected using the Illumina reads in Nesoni. Isolates sequenced only with the Illumina technology were assembled using Velvet. [60, 61]. All 24 isolates included in this study were submitted to IMG/ER for functional annotation. All sequence reads were deposited in Genbank and are freely downloadable from the Genbank project number listed in Table 1. The Francisella 16 S ribosomal RNA data were obtained using the ribosomal database project[63, 64]. The key search words ‘Francisella’, ‘Fangia hongkongensis’ and ‘Piscirickettsia salmonis’ produced 171 hits in the database. After removing duplicates, small sequences and sequences of poor quality, the final dataset consisted of 69 sequences and 1557 bases. To infer the phylogenetic tree of the 16 S data, the software RAxML was used, which is suitable for analysing ribosomal RNA data as covariation patterns are taken into account in the model. The secondary structure was analysed using the substitution model RNA6A by maximising the log-likelihood. The GTR and gamma model was chosen as the standard DNA substitution model. The number of bootstrap replicates was 1000. Multiple genome alignments were computed by employing the progressiveMauve algorithm of the Mauve software using default options. Sequences were extracted and concatenated from each of the 45 genomes to build a core genome of multiple alignments. Core genome SNPs were identified from this alignment as the loci where at least one sequence had a mutated base and it had no missing sequences from any genome included in this study. While it is possible that some of the SNP’s that were specific to a single sequence could have been incorrect due to sequencing errors, this was unlikely in the case of informative sites. Strain-specific SNP’s can have an effect on the estimated value of the mutation rate and the branch length of the phylogenetic tree. However, they do not affect the structure of the tree. The phylogenetic data is deposited in treeBASE[66, 67]. An unrooted neighbour joining tree for the genus Francisella with the genetic relatives Fa. hongkongensis and P. salmonis as an outgroup was constructed using the MEGA5 software based on the numbers of substitutions per nucleotide site in the genome sequences of all strains. The Complete Deletion Method was used for handling alignment gaps. Average nucleotide identity (ANI) was calculated by pairwise genome comparisons with the MUMmer and BLAST algorithms using JSpecies v1.2.1. A threshold of >95% identity was used to classify genomes as the same species. This study focuses on newly sequenced genomes of previously uncharacterized Francisella species and subspecies (Additional file5). Potential IS elements were identified using the BLASTN program (no low-complexity filtering), by querying genome sequences using the ISFinder tool in the IS database and querying flanking regions of the draft genome contigs against the NCBI ‘nt’ database. Altogether, 41 IS elements were found to be present (e-value < 10-2) in the included genomes. Pairwise BLAST alignments of both left and right flanking regions, and full length IS sequence elements, were constructed for all genomes. The results were evaluated by e-value (<10-3), identity (90%), bit score (>40) alignment length and proximity to contig ends. Inherently, de novo assembly of next-generation sequence data implies problems in resolving repeat structures, resulting in an increased risk of underestimating the IS element copy number. Forty-five genomes of Francisella and two genetic relatives were downloaded from IMG/ER (Table 1 and Additional file 6). Coding sequences were extracted from GenBank files and orthologs were determined using OrthoMCL with a BLAST e-value cut-off of 10-5 and an inflation parameter of 1.5. We used the OrthoMCL output to construct a table describing genome gene content (Additional file7) that were used for all pan- and core gene analysis. Heat maps showing the presence of genes in the Francisella genus were generated using custom code in the statistical software R.
To infer recombination events in the Francisella dataset, three recombination detection methods were used: pairwise homoplasy index (Phi), neighbour similarity score (NSS) and maximum chi-square (MaxChi). These methods are conveniently implemented in the PHI Package. A subset of 742 genes (i.e. the core genome excluding multiple copies of genes) was tested for recombination detection on the entire data as well as on individual lineages in the phylogeny (subspecies populations). It should be mentioned that all recombination methods used here do not correct for multiple testing, which may result in an over-estimation of the presence of recombination, in particular for the full data analysis (comprising 45 isolates in total). The views and conclusions contained in this document are those of the authors and should not be interpreted as necessarily representing the official policies, either expressed or implied, of the U.S. Department of Homeland Security or the Swedish Civil Contingencies Agency. Research for this publication was funded by the U.S. Department of Homeland Security and the Swedish Civil Contingencies Agency pursuant to the Agreement between the Government of the United States of America and the Government of the Kingdom of Sweden on Cooperation in Science and Technology for Homeland Security Matters. No competing interests for any of the authors exist. AS assembled all genomes and performed analysis of genome and gene content. JA performed the 16 S rRNA alignment, analysis of over-represented COGs and recombination. CO performed the analysis of average nucleotide identity, IS elements and clade specific genes. SD and DJC provided Francisella isolates that infect fish and knowledge of fish pathogenic Francisella, and contributed to completion of the manuscript. PLA and MF conceived the study. AS, KS, JA, PLI, AJ, PLA, MF drafted the manuscript. All authors read and approved the manuscript.